Pssstt....Hey buddy.....wanna buy some rock? You can't live without it. Too much will kill you. And by itself, it'll make you sick if you eat a table spoon full. That's right, I'm talking about 'Nackull'. I mean, NaCl. Salt. Ever since, well, like a really long time ago, man has understood the value of salt. Not as a flavor enhancer, either. They knew that if they didn't get enough in their diet, they would get sick and die. They also knew excessive heat caused you to sweat a lot, which depleted your salt faster. So, they knew they had to eat salt. It's a good thing they also knew about salts primary use in the ancient world: As a food preservative. Coating a slab of meat, or a fish, or a bird, would pull the moisture out of it and render the item into a dried hunk of nasty whatever it was you started with. Salted food could be stored for long periods of time without spoiling, allowing different regions to trade their local spoils with others. As far back as 5,000 years ago, the Egyptians were trading salt fish with the Phoenicians for cedar, glass and the purple dye they were known for. The problem with salt is, it's not easy to get. Back then, people couldn't go to the Kwikee Shoppe and buy a container of salt. They had to work for it. And it was hard work. There were 3 ways of getting salt. You mined it, you evaporated water for it, or you traded for it. 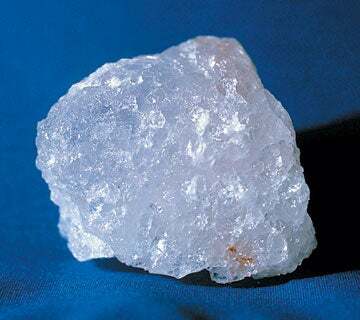 If you were lucky enough to live near a natural salt deposit, you could mine salt like any other rock. However, salt is not very hard. When the miners would hack it out of the walls, they produced a fine powder of salt with every blow of the hammer. This meant the life expectancy for a salt miner was not very long. Especially when you considered they had to dig salt for about 12 hours a day, seven days a week. Slaves were the most common salt miners, although prisoners would also be used. When an ancient civilization sentenced you to hard labor, it was usually in the salt mines. And, it was basically a death sentence. If you didn't live near a salt deposit, but were lucky enough to live near the sea, you could produce salt through evaporation. It was safer than mining, but it was still incredibly hard work. You had to trap water into shallow pools. The water would evaporate and leave salt behind. You repeat the process a few times, and you can go gather the salt off the ground. Sometimes people were lucky, and they could just wall off a tidal flat to collect the water. Other times, they had to transport the water to where the evaporation pools were. Slaves and prisoners again. The third and easiest way to get salt was to trade for it. However, salt was not cheap. With the labor cost and the human cost, (hey, slaves weren't cheap! ), salt could cost a small fortune. So, sometimes trade was defined as 'go steal as much as you can'. So, if you've ever hear someone use the phrase 'Not worth their salt', now you know why.